I thought that was kinda weird. Who else but a rental agency would buy Lariats as fleet? And a rental agency isn’t relying on incentives, they negotiate bulk fleet orders. Incentives for marketing sake? From Car and Driver is it their rendering or based off actual info? 🙄 It is quite apparent that you have not driven any of the newer mid-size trucks, especially a new Ranger. There's no need to give you any more replies in this thread. Supposedly Ford and Rivian have been in talks for the past 6 months and this is not an exclusive deal for Ford / Rivian. Supposedly that is why it did not work out with GM, thewy wanted exclusivity. So I’m sitting here at the ferry landing waiting to pick up my mom for Easter dinner (Happy Easter everyone) and saw a guy driving onto the ferry with a brand new Silverado Z71. This is the first new Silvy I’ve seen so I don’t have any other models to compare it to. I gotta say I didn’t hate it. I thought it looked pretty good actually. Now maybe the Z71 looks better than the plebeian models but it didn’t look all the horrid to me. The lines are aggressive but modern. Of course the interior is what a lot of people are harping on and I didn’t get to see that, but the exterior wasn’t too bad Flame on! Whoa. A Marauder just drove on as well. Don’t see that every day. A new SHO just pulled up too . This is turning into a mini car show. What cracks me up is C&D had a comparison back in January and the Ranger was 2nd ahead of the Colorado. https://www.caranddriver.com/features/g15378489/best-midsize-trucks/ . Makes you wonder who ante'ed up for ad dollars this month? Says the guy with a 2012 Focus. 😄 I've had zero issues or fit and finish problems with my Ranger. The vehicle in the article had a headliner that was frayed. This month’s Car and Drivel absolutely skewered the Ranger placing it in last place in the midsize truck category. I won’t go into details, but they said it felt a generation behind the others. The article is not online yet as far as I can tell. Makes you wonder what the all electric F series is going to cost. This would not have helped me as I traded in a Ford, but everyone gets the $500 or is eligible for the special financing. PS: I originally leased my Ranger but went to the dealer and bought it out yesterday. The lease terms were not very good and I was already averaging blowing past my allotted mileage. I got a fantastic rate and also got a 7 year PremiumCare for a pittance. I'm now paying less in interest over the life of my loan than I was going to pay in lease fees ("rental charge"). Trust me, you are going to love it. The wait was worth it! That second pic look just like a jacked up photoshopped Mustang. Not buying these drawings. Yeah, I already had power fold mirrors. But you had to manually do it every time you wanted to fold them in. This module allows them to auto-fold on lock and unfold on startup. Made a feature I would otherwise never use into one that's somewhat useful. $60 total and 20 minutes to install. There's power fold (which ya gotta have to install this module) but I dont think auto-fold is an option. I just like the new skin. I'm not sure as lots of Lariat owners were asking about it as well (and bought the modules). 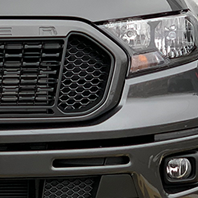 Here's what the Ford site says for 501a on Lariats: • B&O Sound System by Bang & Olufsen with HD Radio™ (SuperCrew® only) • Ten(10) Speakers and Subwoofer (SuperCrew® only) • Technology Package - Adaptive Cruise Control, Navigation System • Rain-Sensing Wipers • Remote Start • Windshield Wiper De-Icer Either way, I have it on my XLT now! Think all SYNC 3 will get that on an update?